Important to help keep your smile healthy, bright, and ready for anything. Broke your tooth on an unpopped popcorn kernel? Took a too-enthusiastic bite of taffy and found yourself missing a crown? We’re here to provide you with the best dental insurance to get you back to normal ASAP, and without the kind of overpriced service that adds insult to injury. 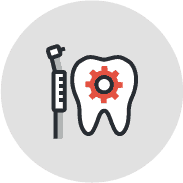 The incredible discounts our customers benefit from mean dental insurance coverage doesn’t have to be a pain. Our dental plans offer oral exams, cleanings, crowns, and more to help keep a healthy mouth and beautiful smile for years to come. And with full coverage dental insurance, you’ll be protected from outrageous fees on the types of routine and emergency services that will make you very glad you signed up for an affordable plan. And slightly less afraid of ever getting movie theatre popcorn again. A deductible is the amount you need to pay for any covered services before you insurance comes into play. For example, if you have a $500 deductible, that means you pay $500 in out-of-pocket costs before your dental insurance plan comes in and pays for any additional services. Meaning? You want to look for a plan that keeps that deductible number low. Some plans may also come with an annual limit, which is a cap on the amount your plan will pay in a year that you’re enrolled. Sometimes these limits are placed on a particular service, so make sure to confirm that with them too. Once your annual limit is met, you must pay all of the out-of-pocket costs for that service. Look closely for any annual limits when choosing the best plan for your needs. Sadly, cavities don’t go away once you hit a certain age. In fact, the opposite can be true. Conditions like receding gums can expose a tooth’s roots to plaque, and lead to cavities. Adults can also experience cavities around the edges of a filling, so yes, you may have to pay to have the same tooth filled twice. And while there’s only so much upkeep we non-dentists can do on a daily basis, dental insurance makes it more affordable to visit the professionals more regularly for all-important cleanings and thorough exams. It really is something to smile about. Choose your dental insurance plan from any of the trusted carriers below. Stop stressing about insurance: let us handle it. *Plans start at **After MSRA BuyHealthInsurance.com has an array of products and services to offer that may be of interest to you. As an insurance agency authorized by the appropriate state and federal authorities, the information you provide and we collect may be used to provide details for those additional products and services. BuyHealthInsurance.com does not send spam or sell your information, and you will never be contacted by anyone other than a BuyHealthInsurance representative without your authorization. By entering information on this site you consent that you may receive autodialed and/or pre-recorded telemarketing calls, emails, and text messages from or on behalf of BuyHealthInsurance at the telephone number and email address you provide. Your consent is not a condition of purchase. You may revoke this consent at any time by contacting us to be placed on our do-not-call list. Your carrier's message and data rates may apply.